In 1947, American historian and veteran of WWII, Martin Mitchell, wins a Fulbright Fellowship to document the end of British rule in India. His wife, Evie, convinces him to take her and their young son along, hoping a shared adventure will mend their marriage, which has been strained by Martin’s war experiences. Soon, Martin and Evie find themselves living in a colonial bungalow in the northern Indian town of Simla. It is in that house, hidden behind a brick wall, that Evie discovers a packet of old letters. The letters tell a story of love involving two young Englishwomen who lived in the same house in 1857. Evie then sets out on a quest to unravel the mystery of the two young Englishwomen and their life in northern India. Her search leads her through the bazaars and temples of Simla and leads to her a greater understanding of the nature of India and its people. She can finally begin to see why two young Englishwomen would be so drawn to these people and to India. 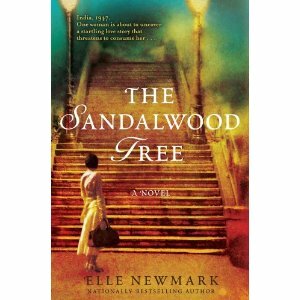 Books about faraway places have always appealed to me and this was the impetus for my reading The Sandalwood Tree by Elle Newmark. This book was difficult to put down and I read it quickly, always trying to grab a couple of minutes to catch up with Evie and see if she had put together the pieces of her mystery. The story has a fabulous ending – do not miss this book! Gosh this sounds like a book I will check out this summer. Thanks for telling me about it. The Booklover Blog at WordPress.com.